UKRAINE – Lviv - A 500-year-old Easter egg was found during excavations in Lviv, the press service of the Rescue Archaeological Service of the Institute of Archaeology of the National Academy of Sciences of Ukraine has reported. According to the report, the pysanka (a Ukrainian ornate Easter egg) was found in a water collector dated to the 15th-16th centuries, on Shevska Street in the central part of the city at a depth of 5.5 meters. 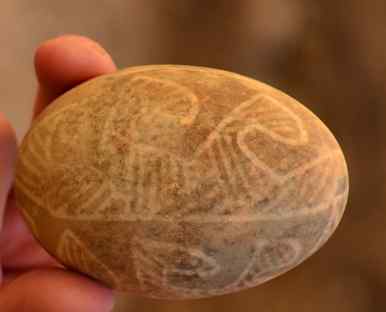 This is the oldest Easter egg found by Lviv archaeologists to date. "Previously, Kyivan Rus pysankas dated to the 12th-13th centuries were found in Zhydachiv, Lviv region, and Khrinnyky in Volyn region, but these were ceramic eggs. This one is made on an egg shell, most likely from a goose egg. And it is very well preserved, almost 90%," a junior research officer of the Rescue Archaeological Service, Ostap Lazurko, said. USA – New York - The city has become an archaeological site, with thousands of artifacts such as an 18th-century bone toothbrush with animal hair bristles and wine and champagne bottles corked centuries ago unearthed to prove it. A copper half-penny and a pair of children's shoes are some of the other remnants of early New York life workers discovered in lower Manhattan while digging to install new utilities for the growing residential and business South Street Seaport area. Last week, under a 15-foot stretch of Fulton Street, near Wall Street, more than 100 liquor bottles from the 18th century popped up, some still intact and corked, as first reported by the news website DNAinfo.com. The ordinary objects paint an extraordinary picture of the city in the 1700s and 1800s — a community of Dutch and English settlers who hadn't yet spread north into what is today's Manhattan. The budding metropolis and its water-borne trade was still expanding into the East River and harbor with landfills for wharves using whatever was available, including some newly found artifacts that had become garbage. 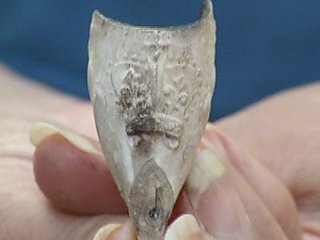 The most recent archaeological pay dirt was hundreds of bottle pieces, including those found last week, from pubs and taverns that had been watering holes for soldiers and sailors passing through. Some of the bottles were never opened, though they're broken. They've been taken to the laboratories of Loorya's firm, Chrysalis Archaeology, to be washed and examined for details such as one seal marked with the year 1764. Last year, workers uncovered a 6-foot-long Revolutionary Era wall, likely from a building belonging to one of the powerful families that owned property and kept slaves. Also unearthed were 18th-century shoe buckles, pieces of pottery and a medicine bottle. Loorya handled a Revolutionary War button worn by a soldier in a British regiment that fought in the 1776 Battle of Brooklyn, where colonizing forces defeated Washington's ragtag army. The dig is part of a four-year, $40 million redevelopment project to be finished by December. ROYAUME UNI – Croxton Kerrial - A medieval manor house in a Leicestershire village, which "disappeared" for three centuries, has been found by archaeologists. The house, in Croxton Kerrial, near the Lincolnshire border, was last recorded in the 16th Century and had disappeared from maps by the 1790s. It was discovered by a community archaeology group, working with the county council, using geophysical techniques to probe the ground. The house dates from the 12th Century. Tony Connolly is the chairman of the Framland Local Archaeology Group, which made the discovery. Mr Connolly, who lives in the village, said: "The house was given to Croxton Abbey in the 14th Century but our records show it was uninhabitable by the 16th Century. "After that, it disappeared. A lot of people in the village had heard about it but nobody knew where it was. Working with an archaeologist from Leicestershire County Council, the group used electrical probes to send currents into Pinfold Field, near the village church, which they believed was a probable site. They were able to generate computer images of what lay beneath the ground. "We have now exposed the great hall and the garderobe - that's the medieval toilet - and we are excavating the kitchen at the moment," said Mr Connolly. 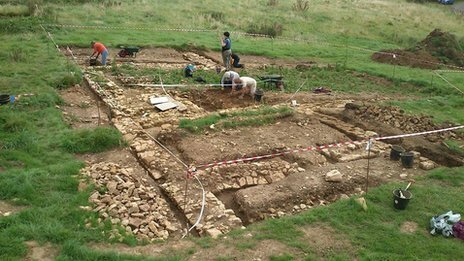 "We believe there are stables and a tithe barn still to excavate. TURQUIE – Didim - Restoration and excavation works have begun at the Apollo Temple in the Aegean province of Aydın’s Didim district. The excavations continue with the support of Germany’s Halle University, İzmir University and the German Archeology Institute. The excavations will continue for 4 weeks. The excavation work that has been conducted in the temple for 106 years by the German Archaeology Institute was canceled this year for the storage and restoration of materials unearthed during this process. BULGARIE – Doupnitsa - Part of an early Iron Age necropolis in Doupnitsa district in southwestern Bulgaria, in the immediate vicinity of the recently-launched stretch of Strouma motorway, has been destroyed, Bulgarian National Television (BNT) reported on August 7. The unique archaeological find, dated to the 11th century BCE, is thought to be possibly one of the largest of its kind in south-eastern Europe. “One of the interesting rituals we witnessed here is the placement of golden items in the middle of the grave and the two opposite copies on the periphery. All this disappears when a bulldozer goes over it; I think it is a crime to let heavy machinery with continuous tracks to pass through and destroy the vestiges of this culture in half an hour,” archaeologist Filip Mihailov from the Pernik history museum told BNT.